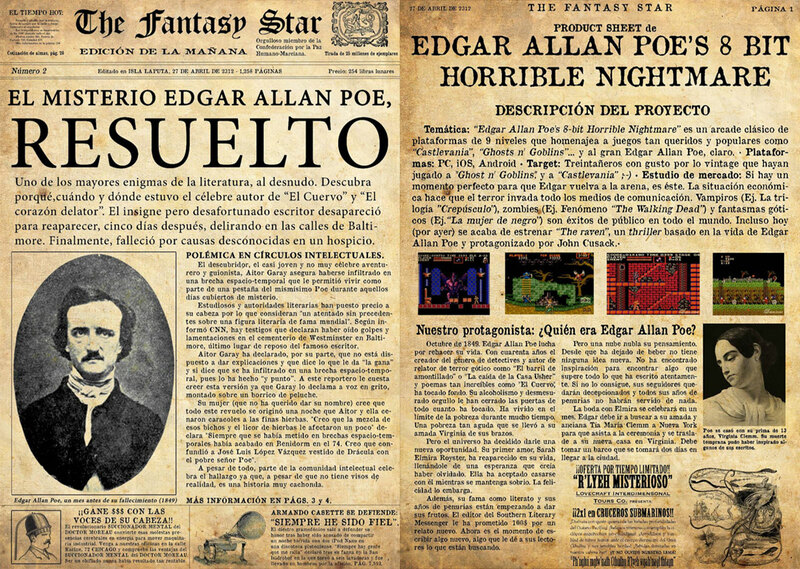 This article is very special for me, because we will talk about the long journey we have traveled to self-publish Allan Poe's Nightmare: the video game based on Poe's stories. There are times when we read some interviews, especially to film directors or TV showrunners, to say that they have been working on a project for more than 10 years, and people put their hands to their heads. Logically they have been doing other projects during that time, but, if there is something that teaches you the experience, is that some projects have their own maturation time, you can move forward, but in small steps. If you believe in your project, you have to keep fighting for it. The most important thing in this industry is to finish, it does not matter if you spend 1 month or 5 years, it is only worth finishing. That has been the mentality that has allowed us not to despair or fall into the temptation of leaving it aside, if you believe in your project, you have to keep fighting for it. Of all the projects I have done, this is the one I feel most proud of, possibly the most personal and the one I have most enjoyed, because I have been able to pour all the learning and experience that I have accumulated over these years, regardless of the delivery date. One day I’m at home running exercises of the Gametopia Videogame Online Course and, as a final project, Aitor Garay, advertising copy, broadcaster and one of the most creative people I know, sends this work: Edgar Allan Poe´s 8 bit Horrible Nightmare. I was fascinated from the first moment. I am a big fan of Poe's work, not only of his most spooky stories, but of his Dupin detective stories or the incredible stories of adventures and travels. After enjoying like a kid with Aitor's work, I spoke with him to see what we could do. The game seemed very interesting to me, but it had to be shaped, turned into something simpler and mobile-friendly. From that moment, I started to collaborate with Aitor in other types of advertising projects and now as a script consultant for games. Each project has its own life cycle, some need years of maturation. In 2013 we started to sketch some ideas, but in Aitor's mind there was a much bigger game than Gametopia could do. So, after several proposals, I decided to take some time to find a way to make a game about Poe that is attractive, fun and that has the essence of the original idea of ??Aitor. Yes, I know, a lot of time has passed since 2012, but we have not stopped working at that time doing projects for clients: ISDIN SUN GAME, the ISDIN lab game to raise awareness about skin cancer in children, Various projects for the Fundación Mapfre, the game about the Marrow Transplantation for the A3Media foundation and our most important project: The Journey of Elisa, for the Orange Foundation. All this seasoned with various Gamified apps or HTML5 games for advertising clients. The important thing is to make a company viable, there are projects with which you enjoy more or less, but success is to be able to carry as many years as we have, paying payroll and living of what we like. With such a calendar, Poe was always in the background, but for the last six years has not stopped being present at any time, but, of that, we will continue talking in the following article.